On a traditional wall-mounted calendar (you know, the ones with the pretty landscape image on top and the calendar view on the bottom?) Sunday is the first day of the week. So, if Sunday is the first day of the week, why does it get treated by many of us Catholics as the last? The last scraps of cash we have for the basket, the last item on our “to-do” for the week (Get to Mass! ), the last priority to spend time volunteering at our Parish, the last opportunity to have quality time with our family…how else is Sunday treated as the “last” in your week? What would it look like if we started treating Sunday as the FIRST day in our week? What would the work week look like after a day of family time with nothing else planned? What would the work week look like after you spend time in prayer during Mass? What would the week look like for your family, by having gone to the Church program on Sunday evening? What would the week look like for your family if we gave our first fruits- our first in the to-do list made up of our time, talent, and treasure? I will tell you from experience, it looks pretty good. Your week will be more people-centric, you will notice less stress, anxiety, or fighting. You will notice a sense of purpose, vision, and meaning in your life. When you start with prayer each week, you end up with a happier week. Try it out. See how it works for you or encourage your friends and loved ones to do the same. 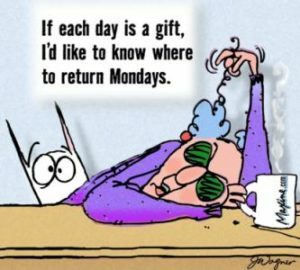 What is the cure to the “Case of the Mondays?” Sunday. It is that simple.